People who've never heard of Bighorn Canyon have no idea how much they're missing. Bighorn Canyon is a little-known treasure waiting to be discovered. The Yellowtail Dam near Ft. Smith, Montana, creates the 71-mile long Bighorn Lake encased by the 1000- to 2500-foot cliffs of Bighorn Canyon. Peregrine falcons, Pryor Mountain wild horses, and bighorn sheep make their homes on the nearly vertical canyon walls. Nothing can beat the sensation of water lapping against the boat in the evening as canyon walls begin to block the sun or of sliding the kayak onto the lake as the sun rises to meet water clear as glass. 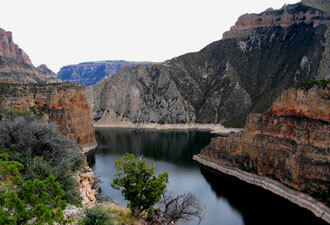 Water is the focal point that draws most people to Bighorn Canyon. It has been drawing and challenging area visitors for hundreds of years. Many stories are told about the adventures of early explorers and settlers who navigated the Bighorn River. In 1825, Jim Bridger, Bighorn Canyon's first recorded boater, built a driftwood raft and set out on the untamed Bighorn River. Three days later, he emerged from the mouth of the canyon, fifty miles downstream, unscathed by the wild river's rapids. On May 31, 1913, Claude St. John and a neighbor, Bert Smith, left from Barry's Landing headed to New Orleans in a sixteen-foot, motorized boat. They reached their destination on August 1st. Many others would follow, mostly to brag that they had challenged the rapids of the Canyon. The Yellowtail Dam has since transformed the once dangerous, foaming Bighorn River into Bighorn Lake, but visitors can still trace the path of Jim Bridger and Claude St. John. For those who don't get on the water, hiking trails and historic sites offer interesting ways to connect with the park. Four historic ranches let visitors experience the lives, challenges, perils, and stories of 19th and early 20th century settlers in the region. 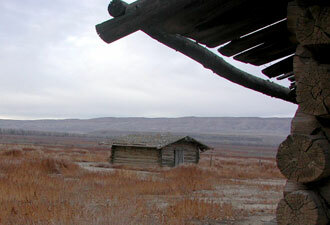 Men like Anthony Mason and Henry Clay Lovell who in 1883 brought cattle into the Bighorn Basin only to see most of them killed during the harsh winter of 1886-87. And, women like adventure writer Caroline Lockhart who in 1926 came to the Dryhead Creek area at age 55 to recreate her life as the Cattle Queen of Montana. 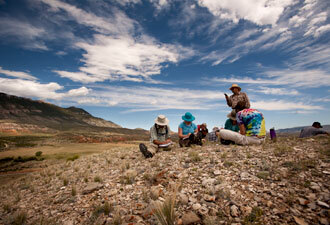 These and other colorful characters enliven the history of Bighorn Canyon. Fourteen hiking trails wind through the canyon, offering tranquil settings, off-the-beaten-path views, and great opportunities for wildlife viewing. The newest, the Two Eagles Interpretive Trail, leads visitors back in time to learn about the indigenous and nomadic people who traveled through Bighorn Canyon. Wayside markers provide insight into the tipi rings left behind and the drive lines used by ancient hunters. If archeology doesn't inspire you, the solitude of the Sullivan's Knob Trail just might. Here's the ironic part: to hear a triple echo you have to break the silence. Get away from it all with a visit to Bighorn Canyon, where you can immerse in the natural word and soak in the wonders of this extraordinary place.